254 pages (21 x 29,7 cm), over 300 colour photos (most of them in habitat). 3 distinct editions (English, German and Italian language). 2004, ed. Cactus Trentino SüdTirol. 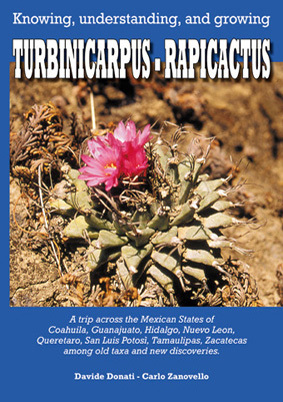 Conceived at the beginnig of 2003, this book is the result of the researches made by Davide Donati and Carlo Zanovello, who took advantage of the collaboration of some of the most important European and Mexican Turbinicarpus experts. Ecology and hypothesis on their origins and their future. Identification keys of the 2 genera. Files on every taxon known until now with specific practises of cultivation and general distribution maps. General practises of cultivation (soil, watering, exposition, grafts, etc. ), useful also for all succulent plants which like the dry limestone soils, with an extended part on the prevention and the treatment of the pathology, with advices adapted at most of succulent plants.